I didn't think it was a productive creative year at the time I was living it. But, when I looked at the spreadsheet, I saw that I had produced more than I realized. In making this photo collage, I also realized that my spreadsheet was incomplete. (and endless rehemming as she grew). I sewed 4 things for her cousin and 1 for a playmate. The two dresses and the cardigan were longer-range projects, but the vast majority of children's items were simple items like tops and pull-on pants and skirts. 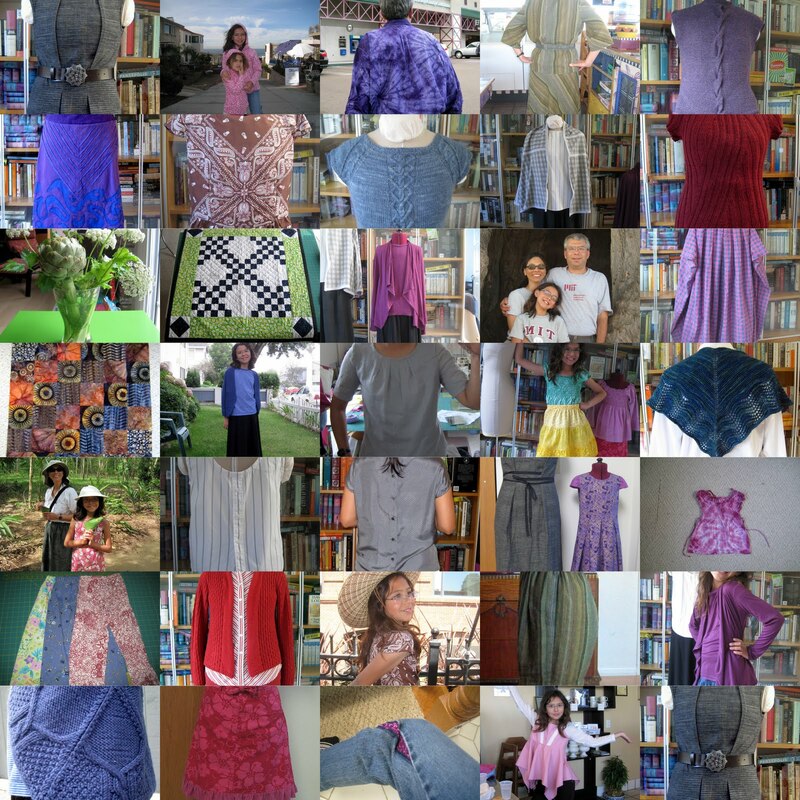 I made 18 things for myself, 4 knit sweaters, 1 knit shawlette, 3 blouses, a pair of PJ pants, a pair of shorts, 5 skirts, 2 jackets and a dress. I also refashioned a dress into a skirt. Bad Dad received new PJ pants. The lessons of Wardrobe Refashion continue to stick. I bought fewer and made/repaired more. I spent about the same amount of $ as before, but was able to buy better quality by buying fewer and more selectively. Those are practices that I want to continue. So far, I've read about half the papers in the book, The Culture of Sewing. Although the book describes the 1850s through the 1950s, I definitely fit the patterns of production and consumption described in the book. I sew for better fit and quality. I sew to fit unusual body proportions. I purchase ready-made items that are labor intensive or require a higher level of skill or specialized tools that I do not possess. I sew for myself, family and friends and for charity. Unlike prior generations, researchers will have an easier time collecting evidence of our home production. The proliferation of DIY blogs proclaim a collective, "We are here!" See how your clothing expenditures compare against the BLS tables of household expenditures by income level. See all the Consumer Expenditure Survey Tables. You will see this skirt repeatedly because it is the only one I packed for the trip. Iris was smart enough to bring two sleeveless shift dresses and two skirts. Doesn't she look fantastic during this spice farm tour in Zanzibar? The real trip skirt I had planned was made of heavy-weight silk twill (600 gram skirt!) employing time-consuming hand sewing techniques and was 2 inches too big at the waist. More on that later. 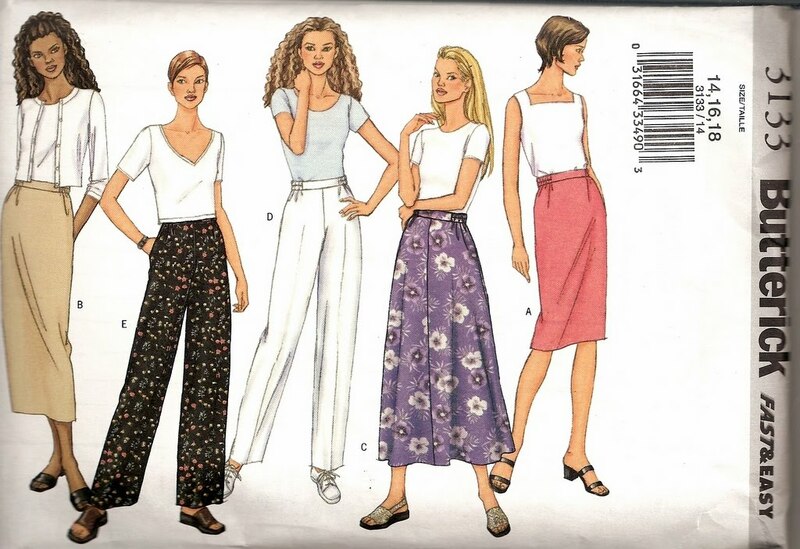 In desperation, I reached for some sturdy cotton and pedestrian-looking out of print (OOP) Butterick 3133. I wanted something washable, with an elastic waist, side pockets and that I could sew quickly. The fabric has green thin warp yarns and black thick and thin weft yarns. It looks black in the top photo and gray in this photo of an ill-fated dress. This sage green Burda 8998 tank top brings out the green in the skirt. We look disheveled because we had just climbed the stairs to the top of the lighthouse on Chumbe island. It was even more difficult because I wore a long skirt* in order to conform to the local modest dress codes for women whenever I was out of the water. I sewed this in such a hurry, I neglected to take a photo of how I added two hidden interior buttoned pockets to the side seam pocket bags. I will do a tutorial on that later. 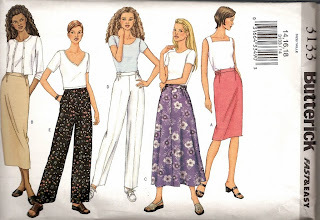 Don't hurry past old Butterick patterns when you come across them. In my experience, they are very accurately drafted, true to size, and fit well. In a 'hip' fabric, they can look very au courant. Don't believe me? 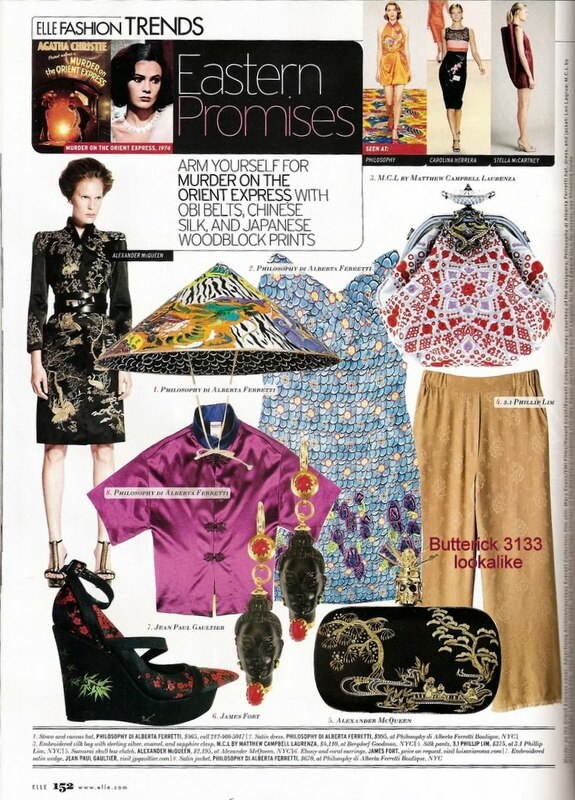 Take a look at this picture from the December 2010 issue of American Elle. Aren't those $375 Philip Lim 3.1 silk pants dead ringers for the wide-legged pants, Butterick 3133 View E? * In retrospect, a skirt this long is overkill. Female tourists just need to wear skirts or pants that reach past the knee. The local women wear their skirts longer, but they don't expect tourists not used to the heat and humidity to do the same. Sleeveless tops are fine, but don't wear spaghetti straps or flash cleavage. One of the many delights of the Mt Meru Game Lodge and Sanctuary is the "nature walk" that is offered daily at 10 AM and 3 PM. It promises a walk along the Usa river, which runs right across one edge of the property. Time is a fluid concept in Tanzania (more on that later). We told the front desk that we were sorry to miss it because we wouldn't be back until 4 PM. No problem, she called the nature guide and he agreed to come at 4 PM to accommodate us. We got back at 4:30 PM, afraid that we had kept him waiting. We went to our rooms to freshen up and he was ready for us at 4:45 PM. We crossed the highway between Kilimanjaro airport and the major town of Arusha, about 15 km away from the smaller city of Usa River, home of the Mt Meru Game Lodge. We followed a road opposite the lodge gate and through a flower farm. Arusha, latitude 3 S, grows flowers for the European market, much as Columbia grows flowers for the North American market. It's proximity to Kilimanjaro international airport is no accident. You can see a square of flowers left unpicked for seed saving in the midfield and Mt Meru in the background. This is a very unflattering photo of me, but you can see the bridge over the Usa river here. When we crossed the river, we met a flat-bed truck full of women leaving the flower farm at the end of their workday. Mark was unsettled by the sight of the women standing up in the back of the truck and hanging on to the wooden slats on the side. But I pointed out that the truck was not overly crowded, they were smiling, conversing and waved to us; and they didn't have to walk home after a long day at work. Then we walked along a road with many people walking home from work or school; the kids were in school uniforms. Other people were engaging in commerce along the side of the road. I saw sellers of fruit, sugar cane, BBQ corn, household goods and toys. It's not polite to take pictures of people in Tanzania without their permission so you will just have to imagine the scene. We also passed many large fields like this. This one has a fruit tree, termite mounds and coffee trees. Notice the trash. There doesn't appear to be any garbage collection. Not much goes to waste here, but there is the ubiquitous plastic, as seen here. The organic matter gets eaten by one of the many goats and cows that roam about. Here are some coffee berries. Each home has a large backyard where people grow some vegetables (squash, eggplant, Tanzania spinach, melons, peppers, tomatoes, bitter tomatoes, maize, lettuce..). You can also see banana trees, date trees, papaya and mango trees, sugar cane and coffee here. Notice the number of satellite dishes. This lady looked at me and my camera and then went back to work. I watched her for some time. She was watering the plants with a large bucket and a big cup. There is no running water here. She hauled the water from the river. After that, she brushed the plants. I think it was an insect control measure, but I am not sure. We continued to walk until we entered the dense part of the city. We saw this hen and chicks right next to the mill house. Later, we saw a woman selling eggs. Even though it wasn't one of the two main market days for the city, there were still a few women selling produce. The chef at the Mt Meru Game Lodge proudly serves locally-grown food that he buys on market day. We were introduced to bitter tomatoes on our walk; we ate them for dinner (they were delish). The scrawny cows that forage around town? They produce exceptionally high butterfat milk that were made into butter and amazing vanilla ice cream. Vanilla beans are a major TZ export crop. Goat cheese and yogurt were also served in many places. There was also a public restroom and wash house; men on one side, women on the other. We saw kids playing and behaving like kids everywhere. I was fascinated when I came across the town tailor shop. There was a man sewing at a treadle sewing machine, a woman cutting out a shirt, and another woman ironing with the kind of iron that you heat up on a stove. Because there was no electricity, they were working outside on the veranda. Have you ever seen a treadle-powered serger? Me neither. My grandmother had a treadle-powered sewing machine, so this wasn't as fascinating. But look at the display of bright fabrics behind the machine! People come to the tailor, pick a fabric and get a garment made to measure. I asked if I could buy some fabric and, after the initial shock, they said yes. Mark and I both gravitated to this piece. We asked the price, and were told 6000 Tanzanian shillings, about $4 for the entire 4 yard piece. We took it. The fabric was really stiff, but softened up when I washed it. The hand felt like polyester and a flame test confirmed it. The women all over Tanzania wear brightly colored fabrics wrapped into a skirt. There are no clothes dryers so laundry was hung up outside in the tropical sun. I was wondering how the colors stayed so bright. Dyed polyester is more colorfast than dyed cotton. I was surprised, when we traveled in Masai regions, to discover that the Masai wear polyester and acrylic plaid fabrics. Synthetics really make sense for the constraints under which they live. The peacock and poly print have been hemmed into tablecloths for our ginormous dinner table. We read while we eat. Iris does her homework on the dining room table. I have a bad habit of inviting people to dinner on the spur of the moment. we need a very long table. 4-yard lengths just about cover the table with a moderate overhang. Iris and I plan to make pillows out of the black/white cotton canvas reverse prints. The white sateen made from long-staple Tanzania cotton will be turned into mommy and me white blouses. Mark will be getting a shirt out of the navy/maroon/beige print. The fuchsia floral print is so beautiful; I am content just to pet it for now. We arrived in Tanzania early one morning and slept until dinner. The next day, I went out and bought my first piece of Tanzania fabric. Now that's efficiency! The Usa river guide appears to be an independent entrepreneur who does not work for the hotel. When someone wants to take a walk outside the hotel grounds, the hotel calls him on his cell phone and he accompanies the guests. He works for tips. Because it was our second day in TZ, we didn't know what was appropriate so we gave him $10. US $ are accepted universally and welcomed in TZ for reasons I will explain in my next shopping post. While this guide knows a lot about plants and their uses, he lacks the academic knowledge of the trained safari guides that have attended Wildlife College, a post-graduate training for safari guides. I've meant to write about this since last October, but I didn't get a chance to go visit the Petersen Automotive Museum until last weekend. If you love cars and/or fashions from the first half of the twentieth century, stop by and see Automotivated: Streamlined Fashions and Automobiles by January 23, 2011. The show was a delight. They paired automobiles with outfits that might have been worn with them. Check out the pinstripes on this roadster--a perfect match for the outfit, non? This was a masterfully-cut bias dress. Check out the flawless seam pocket detail. An open roadster such as this requires a linen duster and goggles. I lost count of how many bound buttonholes there were in this coat. Even if you get a chance to visit the Petersen, you can still listen to the show podcasts. 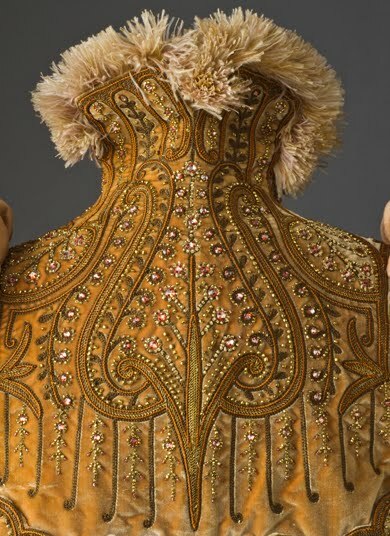 If you have the time, walk down the street one block to LACMA and see Fashioning Fashion: European Dress in Detail, 1700-1915. That's incredible, too. People have asked me what I think of the Tiger mom. I don't know the woman. I haven't read the book. I have nothing to say about her. That doesn't seem to stop a lot of people from commenting, however. If you are going to read something, then this sfgate.com piece looks like a good place to start. I was appalled to learn from my daughter that one of her classmates hears this question repeatedly from her mom, "Why can't you be more like Iris?" That is awful on so many levels. Shouldn't we want our children to be their best selves instead of other people? Okay, that's a biased question and I have put my bias out there in the open. I also get questions about what I did with her when she was young. Did I read to her a lot? This is primarily a blog where I chronicle the happy things that happen in my life. I do not like to dwell on how many things I am/was unable to do. If you want to know the truth, I missed out on large chunks of my only child's childhood because of my health. And don't ask me why I didn't provide her with a sibling. A mother's primary responsibility is to live long enough to teach her cub to hunt for herself. That means I missed out on many things while I optimized my life expectancy. Back to tigers and dragons. As a child, I was able to play Flight of the Bumblebee on my violin at a pretty good clip through long hours of practice. I did not enjoy that particular piece. (Slower Brahms and Haydn pieces are more my thing.) I am glad that music is a part of my life and I don't resent childhood time spent practicing the violin. When I told my mom that I was going to take a break from the violin, she didn't push back. In fact, when I think back, I can't recall a single time when we went back and forth over something. That is, when I pushed back, she let it go. Or when she pushed back, I let it go. I am in awe that a single mom of two, working full-time, made music for my sister and I such a priority that she found the money to pay for weekly lessons with some fantastic private teachers--the kind you have to audition for before they accept you. A high school friend's mom said that, at PTA meetings, they marveled at my mom's child-rearing abilities. It's a good thing she was at work and not attending the meetings. If they knew us better, it would have ruined her mystique. No one really knows what happens behind closed doors. Oops, I digressed again. Back to tigers and dragons. And that is why I gave myself that purple heart and went back to work. Next up, I was in Tanzania less than 48 hours before I made my first fabric score! More later. is a higher yield activity than in LA. The view from our balcony at our last hotel, high tide and sunset. And at low tide in the morning. Our last morning, I woke up, stepped out to the balcony, and saw three men bring their boat perilously close to shore. They dragged the day's catch out, one by one. They might have brought the smaller fish out in twos and threes. None of the tourists who went out on the 'sport-fishing' tours caught anything. They must not be fishing at the same times and places as the professional fishermen. We saw some really large fish being hauled in. One marlin took three men to drag ashore. Another night, we walked along the beach and some guys flagged Mark down and invited us to supper. They had four fish (three varieties) on a table. We picked our fish and they would BBQ it right there and serve the fillet with rice, chips (like french fries) and grilled veggies. We tried black runner, suli suli and dorado. All were delicious. I don't know how they managed to put a different (and complementary) sauce on each fish, but we weren't complaining. They charged us 10,000 Tanzania shillings per person, about $7. They even went to the store and bought a candle to place on the table they set up on the beach. Union Beach cafe is set back a bit from the beach, but they put the tables out on the beach when the tide is right. It takes a certain amount of chutzpah to wear your political sensibility on your sleeve (or business sign). 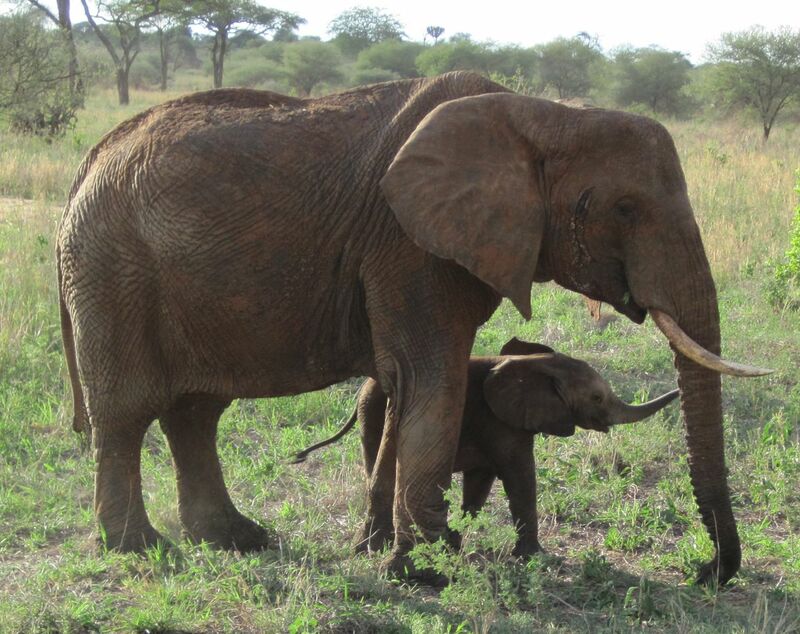 from the Mt Meru Game Lodge and Sanctuary. This eland was particularly friendly after Iris fed it some leaves out of her hand. It only has one horn; perhaps that is what brought it there to the game sanctuary. That's Mt Meru, shrouded in mist. Kilimanjaro is also visible, if you stand at a certain point in the garden of the lodge. It was the perfect place to rest after the 43-hour airplane hopscotch across three continents. 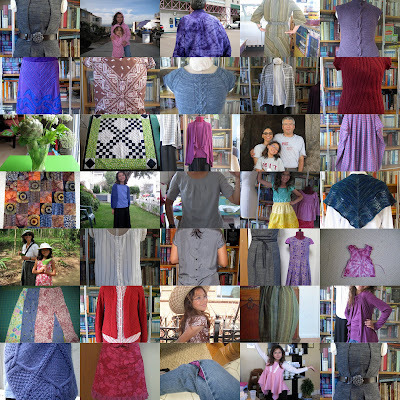 It's hard to tell lately, but this is primarily a knitting and sewing blog. Note I did make Iris' black skirt above and she tie-dyed the green top that the Eland was admiring. after 3 weeks in Tanzania, (mostly) without internet access. We have some great pictures and memories to share. I even visited a Tanzania hospital for treatment! Mark says that might be TMI. But I find the contrast in treatment for chronic conditions in rich and poor countries fascinating. We saw the great migration, something on my life list. It was an awesome trip. I highly recommend Thompson Safaris. Not all guides are equal; they were both expensive and a great value.